Opposition parties have ratcheted up their criticism against the government's drive for "income-driven growth" following their crushing defeat in the recent local elections, calling for an outright review on the policy. The ruling Democratic Party is defending the economic policy, which calls for a virtuous cycle of increasing household income and spending, and the need for an expansionary fiscal policy to buttress it. The South Korean economy heavily depends on conglomerates-led exports, but their earnings have not properly trickled down to workers and households, which deepens income inequality. As part of an effort to fix such an economic system, the government hiked the minimum wage by 16.4 percent to 7,530 won ($6.73) this year, the biggest rise in about two decades, and plans to raise the threshold to 10,000 won by 2020. But the move has had the unintended effect of hampering job growth as smaller firms have dismissed many part-time workers. Liberal President Moon Jae-in replaced senior aides handling the economy and job creation Tuesday in a bid to support his drive for economic reforms. Commenting on the appointments, the main opposition Liberty Korea Party and other minor parties lashed out at the government's campaign for income-led growth. "The government should not blindly stick with its economic policies and needs to pay attention to people and markets' reaction," Yoon Young-seok, a LKP spokesman, said Tuesday. "It also should consider lowering conglomerates' corporate tax and income taxes to boost job growth." The minor opposition Bareunmirae Party expressed regret that the presidential office retained Jang Ha-sung, presidential chief of staff for policy, who it claims is blamed for the government's failure on economic fronts. "The government should review the policy on income-driven growth from scratch, given that data point to serious economic situations over the past year," said Cho Bae-sook, the chief of the minor liberal Party for Democracy and Peace. The governing DP countered opposition parties' criticism while trying to increase communication with the corporate and labor sectors over the minimum wage. But it also appears to be aware that the party's success hinges on how to boost people's livelihoods though it clinched a huge victory in the June 13 local elections, aided by strong public support for Moon and the South's peace efforts with North Korea. "It takes time for income-led growth and innovation-driven growth to be put on full-fledged track. An expansionary fiscal policy can be a tool that can boost them," a senior DP official said. 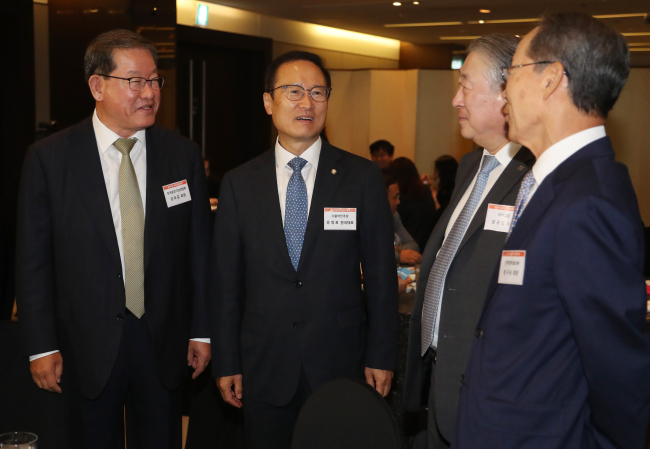 At a meeting with CEOs of midsized firms, Hong Young-pyo, the floor leader of the DP, said Wednesday that a hike in the minimum wage is not the only way to boost income-driven growth.